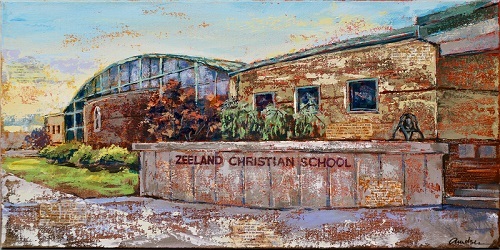 Make a difference in the lives of children by giving to Zeeland Christian School. Philippians 4:6-7 "Do not be anxious about anything, but in every situation, by prayer and petition, with thanksgiving, present your requests to God. 7 And the peace of God, which transcends all understanding, will guard your hearts and your minds in Christ Jesus." There are many needs at ZCS. Choose from a variety of giving options including the General Fund, Tuition Assistance, the ZCS Endowment Fund, the Special Needs Fund, sponsorship of Philippines students, the Stronger Together Capital Campaign and more! Prayer is a huge part of life at Zeeland Christian. We ask for your continuous prayers. We believe with all of our hearts that it is the single greatest gift you can give our school. God gave each of us different gifts. Some of us were given the gift of financial management. Some of us have been given gifts of discernment. Others have been given gifts of compassion and patience. Whatever gift God has given, we hope you can find an opportunity to use it here at Zeeland Christian School. Email Jen Schafer (jschafer@zcs.org) to learn more about volunteering. As a private school ZCS is supported entirely through tuition and generous contributions from our community to support our students. If you are able, consider giving a gift to enable us to grow and provide the best education to all students regardless of financial circumstances. Would you like more information on giving to ZCS? Contact Peter Jenkins, Dir. of Communication and Advancement at pjenkins@zcs.org or 616.772.2609.